Regardless of how “edgy” and “different” I wanted to be with my top 10 list, I think everyone knew that this issue was going to appear at some point. “If This Be My Destiny” is considered by most as one of the greatest arcs in the history of Spider-Man. 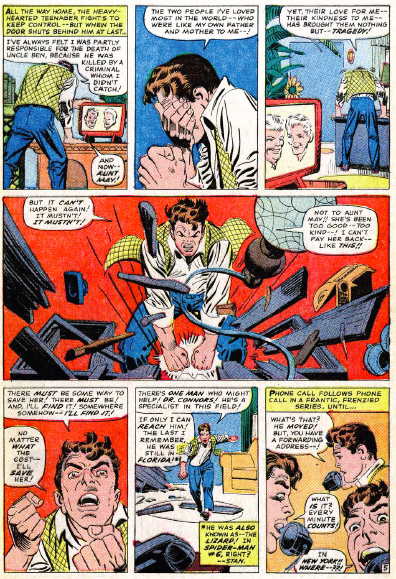 The famous scene in ASM #33 of a trapped Spider-Man lifting tons of steel above his head in order to escape and save his Aunt May is an all-time character defining moment – something that has laid the foundation for all of Spider-Man’s great battles and odds-overcomings for years to follow. If you don’t appreciate this arc and this specific issue, you’re probably not even a true comic book fan, not to mention a true Spider-Man fan. 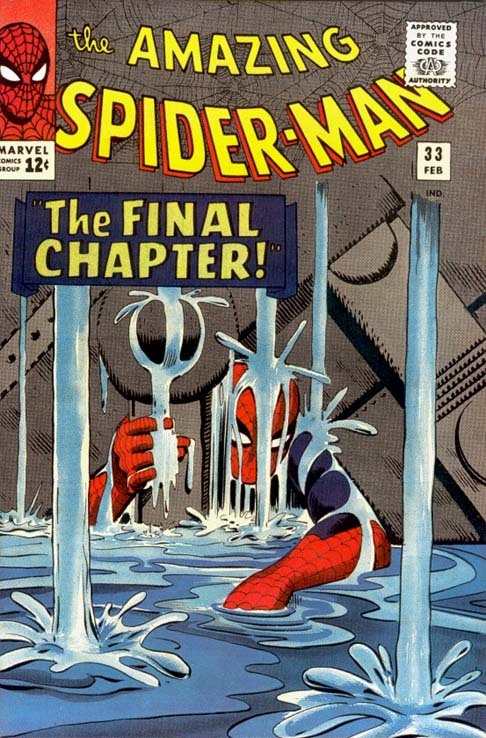 And despite all of this, it’s the the only Lee/Ditko collaboration to make my top 10. 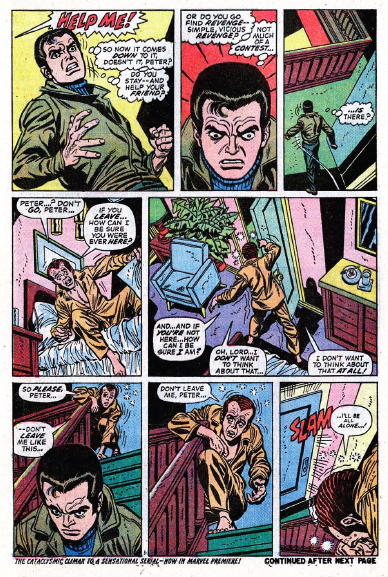 Despite being a huge fan of the character and the Amazing Spider-Man series, I’ve always had mixed feelings about the Lee/Ditko run of ASM #1-38. Yes, I know this run is responsible for the creation of Spider-Man and lays the foundation for EVERYTHING. I respect and appreciate that, but it doesn’t mean I’m obligated to like everything they produced in the early 1960s. Perhaps it’s just indicative of the time and place I started reading Marvel comic books (mid-1980s). But there’s just always been something about Ditko’s artwork and dense plotting that makes reading a lot of these issues less than enjoyable for me. I’m mentioning all this in part because I think it makes ASM #33’s inclusion in my personal list all the more remarkable. I don’t place ASM #1-38 on some kind of pedestal for anything other than their historical significance. But ASM #33 is different. It’s inspiring. It’s one of the few moments (in my opinion) where Ditko really captures the idea that Peter Parker actually wants to be Spider-Man and that he’s just not obligated to be Spider-Man. It’s an important distinction. 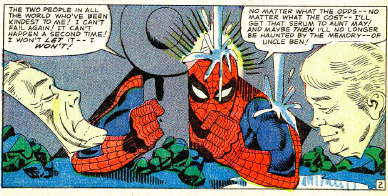 While the Lee/Ditko run is full of fantastic teen angst and conflict, years before Hollywood producers and directors were pouring hundreds of millions of dollars into movie franchises that emphasized all that is dour and depressing about their characters, I have always preferred the moments of triumph and joy. And ASM #33 is the Queen Bee of triumph and joy for a Spider-Man comic. On a more personal note, my acquisition of this comic in 2011 helped inspire me to dedicate myself to Chasing Amazing, the blog. I’ve been writing professionally for more than 10 years and only first embraced the blog medium a few years ago for a site about a professional basketball team that was part of a much larger media conglomerate’s network. I never really considered taking personal memories and opinions and sharing them on the world wide web. That, and I never really thought anybody out there would care. But after dabbling with a few posts, I wrote a piece about how I had just bought ASM #33 and I had now narrowed my chase down to a mere 27 issues. Here we are, less than two years later, and I have all but five issues to go and a much larger than expected audience following me every step of the way, sharing their own Spider-Man memories, and just overall making me feel better about my decision to launch Chasing Amazing. So, ASM #33 has become a personal favorite because it helped me open a portal to all of you, and for that I’m very very grateful. This selection may confuse some people but I believe the logic is sound. Amazing Spider-Man #121 is the far more famous issue of this two-part arc. 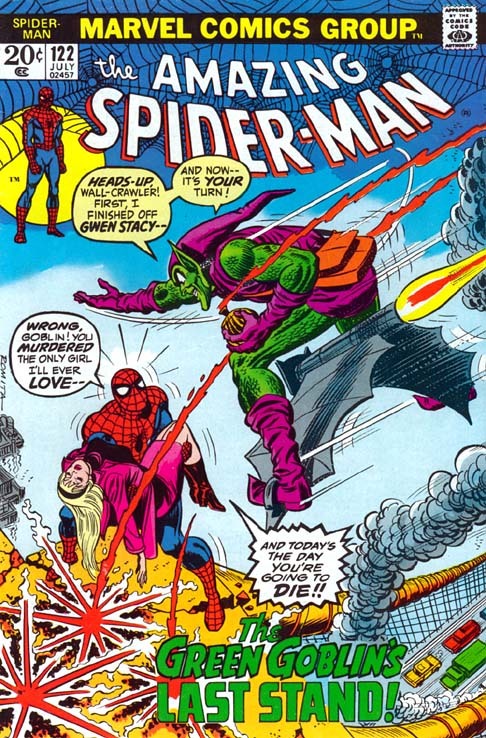 “The Death of Gwen Stacy” is responsible for an entire shift in the way people used comic books as a medium to tell superhero stories. Prior to that issue, the hero had never failed so spectacularly, especially when it came to saving the life of his wife or girlfriend. Imagine if Superman let Lois Lane fall off a bridge and inadvertently broke her neck when he tried to catch her. Prior to ASM #121, that just wouldn’t happen. And yet that’s not the issue I’m talking about here. It’s ASM #121’s immediate successor, ASM #122. This is clearly a matter of fame and notoriety versus personal taste. For me, I actually didn’t enjoy reading ASM #121. Not because of the ending, which is as shocking and depressing 40 years later as it was when it was first written. But rather, I didn’t find the comic book to be well crafted. It initially reads as another Harry Osborn has taken drugs and lost his mind issue and the situation with Norman/Green Goblin escalates so quickly at the end that it really feels like it came out of nowhere. If Brian Michael Bendis was telling this story, it would probably be broken into six issue between when Goblin abducts Gwen and when he finally throws her off the bridge … okay, maybe that’s not the extreme I want the story to go, either. But it doesn’t change the fact that it’s a blink and you’ll miss it moment, and yet its historically significant all the same. 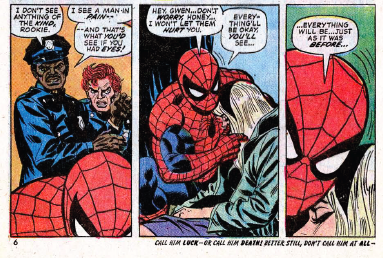 And Conway just absolutely nails a Spider-Man in despair – his rambling to the corpse of Gwen, talking about the love they shared and the wonderful times they had are both heartbreaking and unnerving. 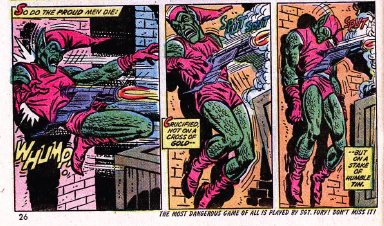 And even when Spider-Man vows that “No!” he will not stoop to the Goblin’s level and kill him, there’s a part of you that just wonders if he’s so broken now, will he go ahead and do the deed anyway. This issue has some fantastic and memorable confrontations – Peter turning away a drug-addled Harry. Spider-Man swinging into the Daily Bugle to pump Robbie Robertson for information about Norman’s whereabouts while J. Jonah Jameson kicks and screams at his self-righteous best. And then of course the final page of the comic, which is one of my favorite of all-time and one that went on to define the Mary Jane Watson character for multiple generations of readers. 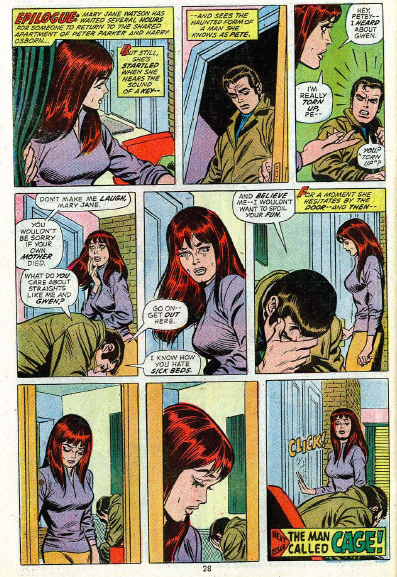 Mary Jane goes to comfort Peter and he dismissed her as the vapid party girl she was portrayed in pretty much every issue prior to ASM #122. Except instead of leaving with her tail between her legs, MJ sticks with Peter to comfort him, laying the foundation for a romantic relationship that would eventually eclipse what Peter had with Gwen in both significance and in fan adoration. Like ASM #672, ASM #122 is an epic comic book that actually delivers in every sense of the word. It’s only slightly negated by the fact that Marvel had the gall to resurrect Norman Osborn from the dead years later and to rub more salt in the wound, name him the mastermind of the entire Clone Saga. But that shouldn’t take away from the fact that I still LOVE this comic book, every time I read it. 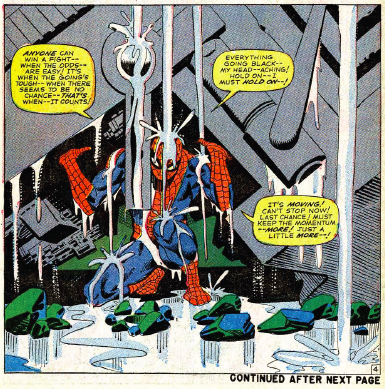 While people claim the death of Gwen marked the end of the Silver Age of comic books, I would say that ASM #122 is the true resolution to a story that was told over the course of 122 volumes. From this point on, Spider-Man was headed in a new direction and while it has hit some bumps along the way, it has long been the contents of this issue that steered the ship. ASM #122 if my all-time favorite issue. In the 90’s I had it signed by John Romita.